For those of you who don't know, the 84 Fiero uses a different coil than the rest of the Fieros (one of the MANY differences between the 84 and other years). As a result, noone makes a performance coil for the car. However, the later year Fieros have a decent selection of performance coils, including the MSD Blaster Coil (part # 8226), available at most auto parts stores and online. Although not so straightforward, upgrading the stock coil to the later-style coil isn't so difficult. I would like to appologize for the lack of pictures, I don't own a camera. If anyone would like to contribute pictures of the areas in the install, I'd be more than happy to give you credit. The old coil bracket is held in by a 13mm nut on top and a 13mm bolt on bottom. I got these off with a 13mm deep socket and a 6 inch extension. The top bracket is under the fuel filter bracket, just slide that bracket out far enough off the bolt you can slip the top bracket down through and off the bolt. Disconnect the connector and coil wire. Next, you can either re-use the old bracket, or get one off an 85-86 iron duke. 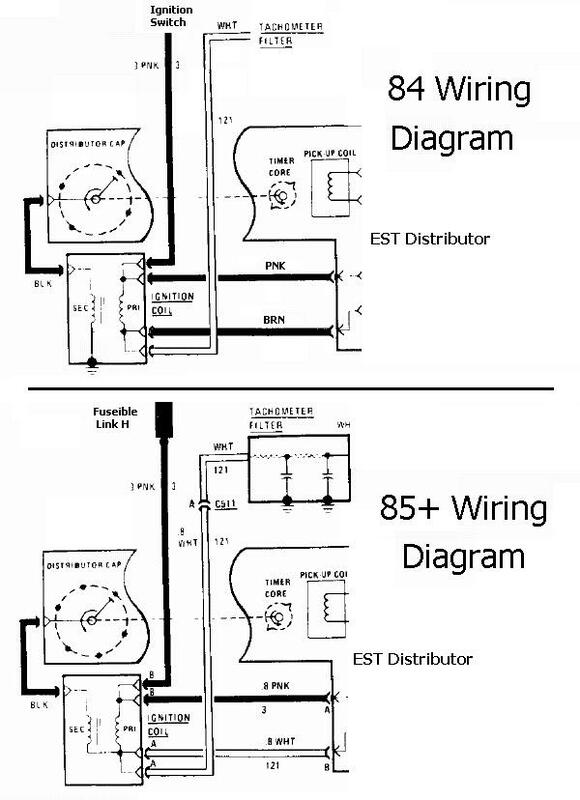 The 84 bracket will not fit the 85+ coil, as the 84 coil is larger. Until I can find the earlier bracket, I just bent the top ends of the bracket toward each other and put the two top screws in If you choose to re-use the original bracket, you'll likely need to drill out the factory pins holding it in, unless the coil has ben replaced before. My car of course still had the original coil. First the grey connector: Obviously, the large pink ignition wires need to be connected together. Next, you'll notice a wire that goes along with the pink wire, back into the engine bay. This wire connects to the tach filter. Connect this wire to the black wire with the white stripe on the grey connector. Next, the black connector. The black connector and the original harness both havea black wire with a pink stripe. These wires go together. That should only leave the original harness'es brown wire, and the black wire on the black connector. Connect these together. Now plug the connectors onto the coil (they only go on one way, black connector first), reconnect the coil wire, and fire it up. It should start and run the first time. Take it around the block and try it out. Thanks for posting this. I've been meaning to do the same thing, but dont have an '85 manual or the new coil/coil connector yet. This saved me a fair bit of wire tracing. Notice any performance differances with the new coil? What's the seat-of-the-pants meter say? 'Seat of the pants' says there's a small but NOTICEABLE improvement. Worth the time and effort. There aren't any 85+ Fieros in the yards around here, so I went through about 40 different cars looking for the connectors. FInally found them in a V6 Firebird with the 2.8L, got them for $5. The only place locally I could find that carried them wanted $20 for EACH connector! Do you fanaticly measure your gas mileage? I'd be interested to see if there's an improvement. Makes sense to me that there would be a small one from better fuel burning. The couple times I've measured my gas mileage I've gotten 23mpg. I just filled up today and reset the trip odometer, so I'll let you know how it does in a week or so. I'll also be installing an MSD 6T Igition Box as soon as it gets here, so I'll be able to compare with it, too. This is the longest "week or so" I've ever experienced. That tank of gas has lasted more than seven freaking years! The thread was archived for years before it got moved to the FAQ section. -The coil lasted 7 years before it suddenly died without warning.